After you complete the Classroom portion of your training, you are ready to JUMP IN! Practice the skills you learned about in a safe and fun pool setting. 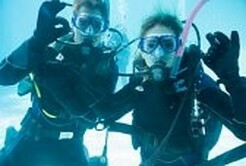 All classes are taught by PADI-certified Instructors and Dive Masters. Also Included... Our EXCLUSIVE gear program! Join us for one of our pre-scheduled group pool classes. See our SCHEDULE for more details or contact us for info. Choose-Your-Adventure style pool class: you pick ANY day 1 and ANY day 2 classes that fit your schedule. All we ask is 24 hours notice of the class you want to join. We also need a minimum of four students for a class. See our SCHEDULE for options. Maximum flexibility and individual instruction! Schedule your private or semi-private pool class with one of our instructors around your busy schedule. Pricing varies. Contact us for a quote today.